A devoted animal lover and photographer, Mr. Mohamed Shahidullah recently received the Shining World Photography Award from Supreme Master Ching Hai. The award was granted in recognition of his exceptional, enlightened photographic talent, selfless work with outstanding loving kindness towards animals, and his generosity benefiting the world and all humanity. Supreme Master Ching Hai also granted US$ 2,000 as award money to him so that he can continue his noble work of caring for animals. Mr. Shahidullah is a low-income laborer from Bangladesh who lives and works in Saudi Arabia. Even though he has not been able to save a penny, for the last 8 years he has been feeding and helping desperate animals. He is currently taking care of about 110 cats and 10 dogs, as well as many birds. He spends most of his income to feed his animal friends. Even when there is no food for him to eat, he feels he must feed his animal friends first. Locals now refer to him as the cats' Father, and indeed some of his animal friends would not survive one day without the nourishment and love provided by their human father. To care for so many animals every day requires great dedication from Mr. Shahidullah, his efforts and sacrifices truly are an inspiration to us all. 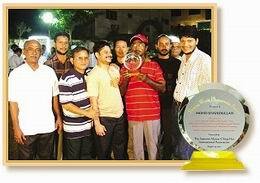 Mr. Mohamed Shahidullah and his friends are celebrating his Award. He said, As an animal lover, I feel that animals represent the beauty of life. And I believe they play an important role in our society. I cannot imagine this world without animals. Many people in his local area did not understand much about his ideas and actions. 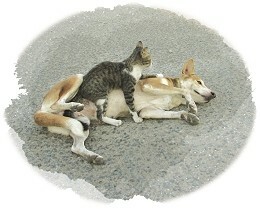 But as his noble and loving kindness went on, they also began to think about the need to love and care for animals. His loving action was also introduced to a local newspaper, which said, "Mr. Shahidullah is a perfect example of the wondrous co-existence that humans and animals can enjoy." When he was attacked by robbers on the street, dogs rushed to help him and chased the robbers away. 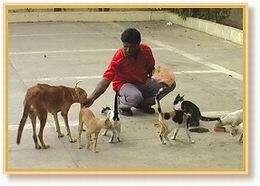 Mr. Shahidullah has another special way of spreading the message of loving animals. He is a highly talented photographer. 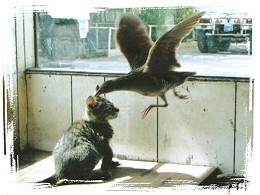 His photos portray humans and animals, and also animals of different species in perfect co-existence. In his photographs, a bird is kissing a cat, a dog is hugging and caring for a cat just like a mom, a kitten and a little bird are sitting together like friends. His beautiful artistic creations are touching many people, encouraging them to re-evaluate their views of our animal companions. 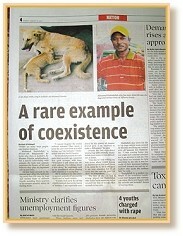 Local newspaper introduced his loving action toward animals. He is also a huge fan of Supreme Master TV. It has been his favorite TV channel since it was launched. He enjoys viewing Supreme Master TV along with his cats and birds everyday. Master Ching Hai's loving award meant so much to him that he reciprocated with these kind words. With due respect I would like to inform You that, I received beautiful award plaque, some DVDs and beautiful books with Your biography, also US dollar 2,000. I am very happy for receiving Your positive award. Your award given me more responsibility for animals. I will keep my responsibility until my death. My special thanks to You for beautiful and valuable Shining World Photography Award. I will be ever grateful to You. Wish Your sound health and long life. Postscript: Upon learning of Mr. Mohamed Shahidullah's noble work, our Association members in Hong Kong immediately sent him 100 bags of "Lively Doggie" vegetarian pet food so that he can feed his animal friends with a better and healthier kind of food.